This badge dates from 1350. 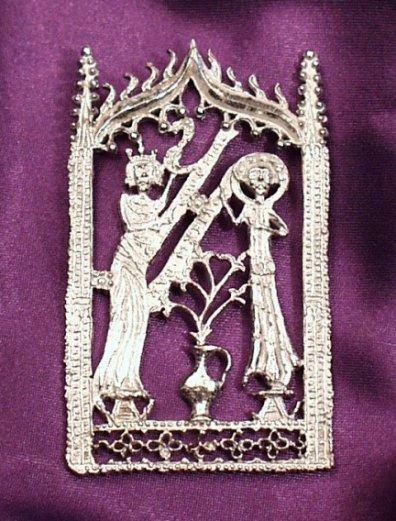 The veneration for the Virgin is illustrated by this intricately detailed badge. Within the architectural frame stands the crowned figure of the Virgin to the left and Gabriel to the right. Between them is the Scroll upon which is the abbreviated legend“ ECCE : ANCL : AVE : MARIA”. Below this is the Annunciation Lily rising from the Lily Pot. The Lily stood for the immaculate conception of Christ and the purity of virginity and innocence.